Today, we are going to discuss how to design Facebook style chat slider layout. Slider layout design is very easy and simple only we need to include html code and CSS style sheet. Here is we have used position property of CSS to set the slider at fixed position. Basically The position property specifies the type of positioning method used for an element (static, relative, fixed, absolute or sticky). 2. Displaying the user details in list order inside the outer element of div "chat-sidebar". This consists of html code for slider layout. 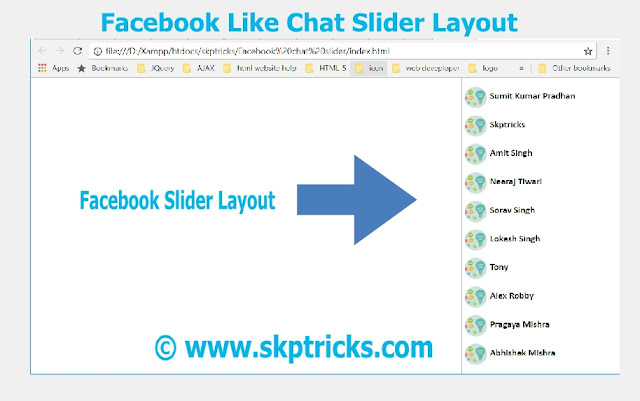 This consists of style-sheet design for slider layout. This is all about the Facebook chat list on right using HTML and CSS. Thank you for reading this article, and if you have any problem, have a another better useful solution about this article, please write message in the comment section.